Home Unlabelled Precision Air Services takes delivery of first ATR 42-600. 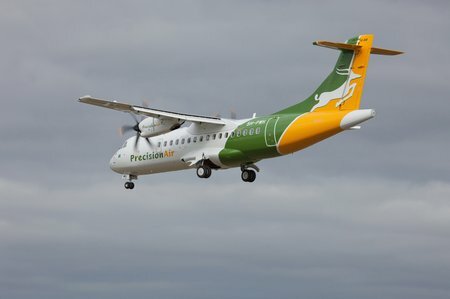 Precision Air Services takes delivery of first ATR 42-600. 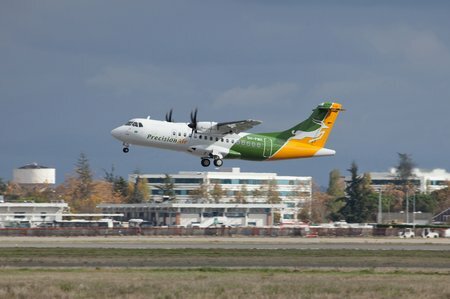 Tanzanian carrier Precision Air Services has today taken delivery of the first ATR 42-600 to go into scheduled commercial service. It is also airline’s first brand new -600 series aircraft out of 5 (4 ATR 42-600s and 1 ATR 72-600) ordered in December 2011. The official ceremony which took place earlier today at the ATR Delivery Center in Toulouse, France, was attended by Alfonse Kioko, CEO of Precision Air Services and Filippo Bagnato, ATR CEO. The new airplane will be the very first ATR 42 of the latest -600 series to enter into commercial service. The introduction of these new series airplanes will increase its ATR fleet to 14 aircraft thus making Precision Air Services the largest ATR operator in Africa. The carrier is keen to further develop its regional network, adding new routes and frequencies to its domestic and regional markets. This fleet expansion will allow the airline to offer its passengers the advantages and comfort of the new ATR -600 series ‘Armonia’ cabin. The second ATR 42-600 will be delivered towards the end of this year with the other deliveries continuing throughout 2013. The handover of the ATR 72-600 is scheduled for 2014. Filippo Bagnato, Chief Executive Officer of ATR, declared: “The delivery of the very first ATR 42-600 in the African region is the latest milestone in ATR’s long journey together with Precision Air Services. Today Precision Air Services joins a group of world class airlines that are redefining on-board comfort and achieving an unrivalled level of cost efficiency. With the ATR 42-600, Precision Air Services carries on its approach of continuous improvement and meeting the challenging strong growth in air travel in Africa in the most cost-effective way possible. We are convinced that our longstanding and fruitful long-term relationship will continue growing and developing in the coming years”. ATR also supports Precision Air Services’ training needs and in 2006 set up a partnership for certified aeronautical maintenance training for Tanzanian students. Each student spends one academic year at the Aeronautical Technical School in Toulouse, France, and then joins Precision Air Services’ maintenance crew in Dar Es Salaam. So far, 12 students have already graduated from these courses and joined the airline. 5 students are currently undergoing intensive training, while 24 more are expected in the coming years. Today, a total of 105 ATR aircraft are currently in service in the fleets of air carriers in Africa and Middle East.